The Lingua File from TLF Translation: It's So Fluffy! What Does "Fluffy" Mean If You Don't Speak English? The other day I came across something sort of weird... the word "fluffy" isn't very universal. Sure, a lot of languages have similar words, but none are exactly the same. I currently live in Spain, and I've found that my Spanish-speaking friends who speak English understand it, while those who don't can't find a useful translation that really encompasses everything the English word means. So what does it mean? If you look "fluffy" up in a dictionary, the first definition you might get is: "of, resembling, or covered with fluff". You must admit, that's pretty useless if you don't know what "fluff" is. Apparently, "fluff" is "soft fibres from fabrics such as wool or cotton which accumulate in small light clumps". In English, clouds can be fluffy, clothing can be fluffy, and above all, soft toys can be fluffy. 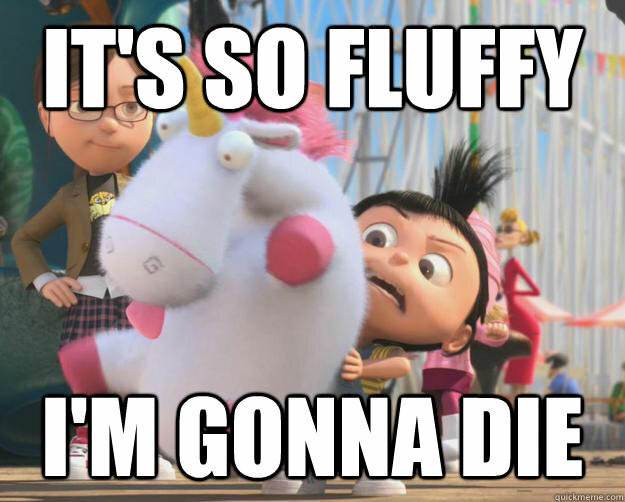 If you've ever seen the film Despicable Me (in English), you'll have seen, without a doubt, the best example of "fluffy" in use. The French version says C'est trop génial!, which is more or less "It's brilliant! ", which completely ignores the plush and fluffy nature of the soft toy. However, it doesn't make the scene any less cute! These aren't the only two examples. The Italian version uses morbido (soft) and the Portuguese version uses fofo (cute). However, I don't think it's just a Romance language issue! For Danish, they chose to use nuttet (cute). From the versions available, I reckon German comes the closest with the term flauschig, which apparently means "fleecy" (though I'm not a German expert). To me, that seems quite adequate when it comes to describing the unicorn, don't you think? Apparently the word is fluffsi, or something like that. Is this accurate or a loanword? When it comes to the word "fluffy", is it uniquely English or just a lacuna between English and Romance languages? Do you have a better translation in your own language? Tell us your thoughts in the comments below, especially Swedish speakers, since your dubbing has me bamboozled!